Nature doesn't operate at the speed of Twitter. Well, maybe it does for microbes. It takes more patience to see changes in populations of big things like birds and trees. It typically requires stitching together lots of observations over many years or over large areas. That's a very important thing to do. 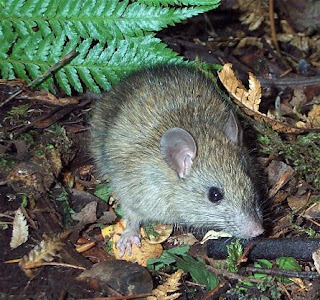 Biologists expect a lot of New Zealand's species to be responding to the many physical and biological changes to environments caused by people doing what people do. Surprisingly, New Zealand ecologists are largely in the dark about most of these changes because big datasets of observations of wild species in and around rural and urban landscapes don't exist. These are where environmental changes are most pronounced. Or, when these datasets do exist, they're typically scattered about unconnected, usually only in hardcopy and in a whole mix of formats (one shining exception to this is the NZ Ornithological Society's wonderful bird atlas). The New Zealand Biodiversity Recording Network (www.NZBRN.org.nz) seeks to change this. 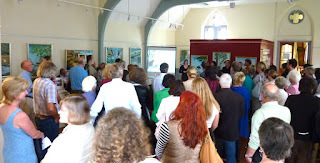 It provides an online place where everyone from school children to professional biologists can enter in what they see. You can either enter observations straight onto the website or download spreadsheet templates that you can use to enter offline on your laptop or iPod Touch. With everyone's eyes open to the natural world around them, we can see how nature is changing. NZBRN was covered by TVNZ's TV One News recently, featuring Landcare Research's Colin Meurk and Lincoln University's Jon Sullivan. Click the image below to check it out (and note that the NZBRN web address is www.nzbrn.org.nz and not www.nzbrn.com as they mention in the story). 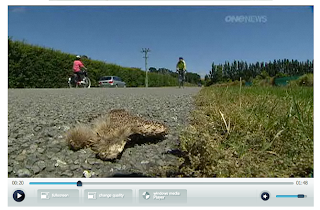 This summer, NZBRN is challenging people to record road-kill hedgehogs and other flattened fauna that they see on roads. Counting road-kill while driving or biking about New Zealand over summer is a convenient way to collect lots of observations. One man who has already been doing this in the North Island for several decades is biologist Bob Brockie. In a recent article in the New Zealand Journal of Zoology, Bob and colleagues describe how hedgehog numbers in the North Island have declined by 82% between 1995 and 2005. And nobody knows why. Equally mysteriously, the decline doesn't seem to have happened in the eastern South Island, although we need many more recent observations to compare with past data to be sure of this. That's where you can help. You can read more about counting road-kill and other projects involving NZBRN in the latest NZBRN newsletter, available here. 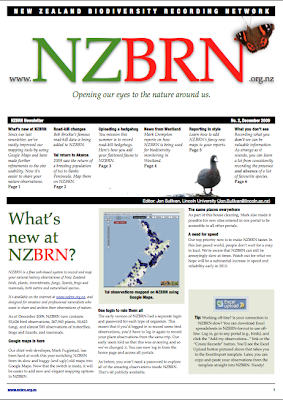 At its simplest, NZBRN is great for creating species lists for locations and mapping species distributions. 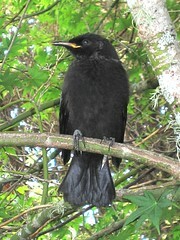 There are also all sorts of potential uses for NZBRN, including describing the spread of new pest and weeds, watching native birds reinvade New Zealand cities after pest control and the maturation of native plantings (hopefully), determining which species are most sensitive to climate change, or describing how species respond to large-scale conversion of farmland from sheep to dairying. The list of uses is only limited by the depth and breath of observations in NZBRN. Ecologists in places like Europe and America have access to many big long-term datasets from urban and rural landscapes, often collected by keen amateur naturalists. These data have revealed all manner of changes, including shifts in species' seasonal activities and distributions and alarming declines in common birds and butterflies. Plants, birds, and insects are all responding to climate and landscape changes in different ways, disrupting the interconnections that make the natural world what it is today. These are important things to know about New Zealand nature. For example, there has been concern raised here that many of our butterflies may be in decline (for example, watch this TVNZ Breakfast news item), but there's little hard data to back up that perception or to inform ecologists about the causes of any such declines. The observations needed to describe such changes in nature are not complicated or difficult. All we need is "What? ", "Where? ", and "When? ", repeated over and over at lots of times and places and for lots of species. 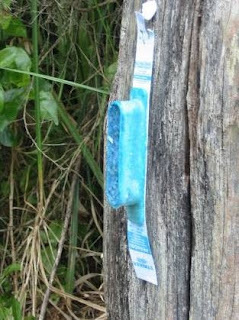 Also, recording when you looked for something and didn't find it is just as important (and there's an article on that in the latest NZBRN newsletter). If lots of people do this, together we'll know a lot more about the nature around us. The best way to really get into NZBRN is to pick a few favourite species and places and start recording whether they're there or not each time you visit. A favourite place could be a summer holiday spot or your back garden or your drive to work. 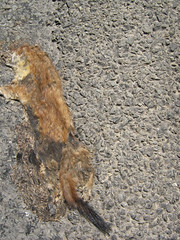 Favourite species could be fantails or all butterflies or, yes, even squashed road-kill hedgehogs. Recording species certainly takes the monotony out of a long summer drive. When you get into the swing of it, it can be good fun. You'll find yourself noticing all sorts of things around you that you would otherwise have passed by.